This unique iPhone application called KanjiStretch transforms any alphabetical name into Kanji characters. The Kanji results are phonetic characters, so you can arrange the applicable Kanjis as you like. 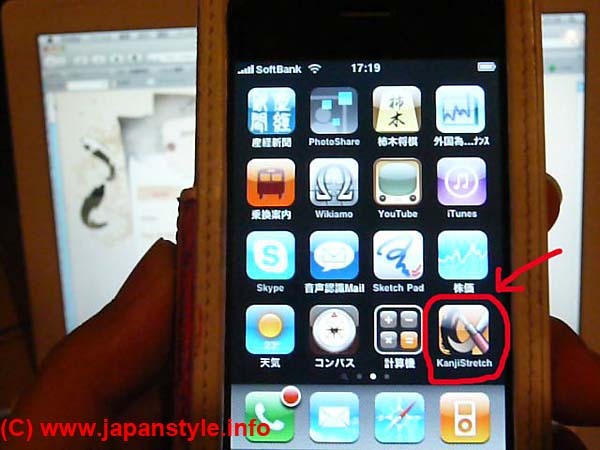 You can display your Kanji name in calligraphic font, and he result can be in PNG format and e-mailed. I actually downloaded the application (it’s for sale) into my iPhone, and took movie while I was using it. – Enter your first name and last name, and tap “Done” on the iPhone keyboard. – Applicable Kanji characters will appear. Compose your Kanji name with characters selected from the Picker. – Tap “Brush!” button to display your name in calligraphy-brush. – Tap “Mail” button, and select the size of the image. – PNG formatted result will be attached on a new e-mail message, pick address and send it. What do you think? It’s an interesting application, isn’t it? For the development of KanjiStretch, a Japanese entrepreneur who founded Livedoor, [W:Takafumi Horie] was involved in, and worked as a project producer. He is popularly known as his nickname, Horiemon after a Japanese popular manga/anime character Doraemon. I found a cool idea from a user. It’s going to be fun if you can put your Kanji name on your arms!